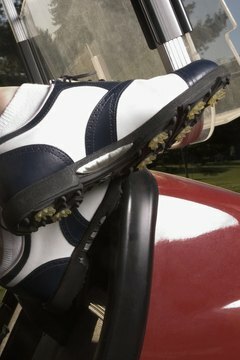 While not a necessity, golf shoes can inhance your stability through your swing. Golf shoes are not required when you're playing golf, but they are highly recommended for serious players as they are designed with spikes on the bottom to help the golfer not slide when swinging. With golf shoes, you can improve your game with the addition of traction. There are several types and styles, but you'll want shoes that fit, are comfortable and will last at least through the golf season. Go to any sports shop or golfing pro shop. You're going to only finder the cheaper brands and shoes at a sporting goods store, but it's always good to hear advice from professionals at a pro store. Make sure you know your shoe size. A golf shoe might fit you differently than your normal shoes, so get measured by someone at the store who can assist you or by trying on shoes. Look at the spikes on the bottom of the shoes. You'll want plastic spikes that are replaceable. Metal-spiked golf shoes are prohibited on many golf courses because of the damage they can cause. Also, with replaceable plastic spikes, you won't have to worry about purchasing new shoes if there is wear or damage to one of the spikes. Look at the material used on the inside of the shoe. Comfort is important, and it is highly recommended to find shoes made of leather. Leather golf shoes also last the longest. Try on any shoe you're interested in before making a purchase. Walk some distance in the store or even outside to make sure the shoes feel comfortable. Choose a design and color that is subtle and doesn't stand out too much. Regular white golf shoes are usually the standard in the game, and having a vibrant color or intricate design will make you stand out on the course. You also don't want to distract other players with your shoes. Purchase leather treatment lotion when you buy your shoes to protect them from water and other damage.